New Action Blocks & Campaigns! Our update today primarily focuses on increasing gameplay functionality within the game, with some of the items I know people have been asking for for years! First, we have the long-awaited Silver Crown Doors & Gates, which only open and close after you’ve completed the level! These are included with the Gold Crown Doors & Gates. Second, we have the long-awaited Low Jump ability! This means you can jump as low as the zombies do, but without being a zombie! It’s a new option within the “Jump” Ability Block. Third, and the most exciting in my opinion, there is now the ability to enter an ID into World Portals! If set it to 0, entering it takes you to the regular spawn point, but now if you set it to the ID of the special new World Portal Spawn Point, you’ll enter the new level at a special preset location! You receive these new spawn points with the same number of world portals you own! They are owner-only though, so only the world owner can place them. We also have a system in place to combat exploitation where you have to be the world owner (or at least in the crew) of both worlds (the one with the original world portal, and the one with the special spawn point). If you start trying to skip worlds or parts of levels, it’ll just spawn you to the regular spawn point! 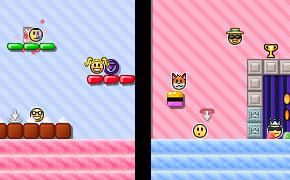 Finally, we’ve expanded on the Candy Pack to finally include the Blue Candy block, as many people wanted that as well. In addition to all this, we’re releasing the new Technology campaign! If you’re short on energy for World Portals, you can get some by completing it. If you’d like to find out more about this update and join the discussion about it, feel free to visit the Fan Forums!